In looking back over my blog I realized that I often make lists about place to go and things to do for the spring and summer but I've never done that for the winter. I'm not a huge fan of winter. Living in New England I'm certainly used to winter but looking outside on cold/ wet/ rainy days I tend to want to just stay inside. I envy animals that get to hibernate. That said staying indoors gets OLD after a while and I'm always looking for things to do with the boys to get us out of our rut. 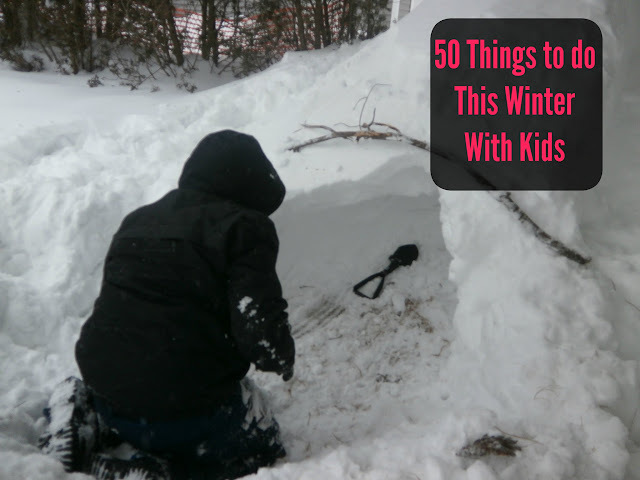 I thought I'd challenge myself to list 50 things we could do/ places to go this winter. Maybe that will motivate to get out and get going. I hope so because I'm pretty excited about all these ideas. Now we just need some snow-- not slush, not freezing rain, but snow. If it's going to be cold out, I at least like it to look pretty and inviting and something about a pile of white fluffy stuff makes us all want to don our winter gear and get moving. In the meantime we'll start on some of the field trip/ indoor ideas. 13. Hiking-- I think I hate it but I actually have fond memories of hiking with the boys in the snowy weather with all our gear on. 21. See the Dr. Seuss Museum and sculpture garden Springfield, Mass. 28. Enjoy the sunrise with hot cocoa, and cinnamon buns outside (we loved this last time!). 31. Make Snow ice cream-- so many recipes to chose from on Pinterest! 50. Make snowmen pancakes, have a hot cocoa bar, and watch a movie by the fire.